Elon Musk made news with an almost $10 million purchase of Tesla stock last week. But he wasn't the only insider buying shares. So with tons of shorts, today's bearish note by Morgan Stanley, insiders are probably making a big mistake here, right? I don't think so. Tesla bears are stacking up while insiders are buying. Musk bought about $10mm worth of stock and two other insiders also bought shares in that same time. The two other insiders are directors who's stock became exercisable in 2012 but apparently decided now is a good time to buy those shares. It also does not show that these directors sold those shares implying they think the stock's going higher. Meanwhile the short interest reached a high for April. OK. Musk said in a tweet in April and the company said on their recent earnings call they are racing to profitability in Q3 or Q4. Managers have been reported to leave Tesla. The Street seems to view these events negatively. But if you imagine Musk racing for profitability and his comments "barnacles on barnacles" of costs everywhere, you can bet that he's chopping anything that's remotely unnecessary. If anything all these executive departures could be under the umbrella of cleaning house and that race for profitability. Our model showed as of last quarter that Tesla, in fact, does not need cash (scroll all the way down in the Tesla tab). That may be one reason Musk didn't feel he needed to listen to any 'bonehead' questions on the conference call. Musk may feel his cash needs are in the clear. But do the math. If earnings can be flat or up in Q4, 2019 earnings are going to be enormous. When we flow through some of the trajectories needed for Q4 profitability we get $14.51 for 2019 EPS. Slap a 50X PE and we get our $725 target. Why a 50 PE? Because going from -$5.00 in earnings to +$14.51 classifies as a rocket-ship growth company. Pick your own multiple for first year profitability. Let us know what you think. But if they see a profit in Q3 or Q4 which implies huge 2019 EPS, what's going to happen to the shorts then? We had a recommendation, a Buy Rating on Trade Desk ahead of their earnings report Thursday with numbers much higher than the Street. The stock had 30% of the float short and the earnings numbers were insane. The stock was up 43% on Friday and it's still going. We also warned AMD shorts and the stock bolted higher on earnings. Guess how much of Tesla's float is short. 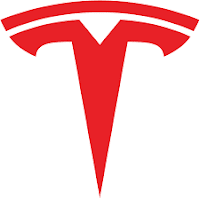 It just so happens to be 31% of Tesla's share float is short, about the same as Trade Desk's was on Thursday before it's monster 43% one-day move. If Tesla delivers anywhere close to profit by Q4 analysts will have to swivel and do the math on 2019. The earnings potential is too big and the shorts are too confident. Meanwhile insiders are starting to own more shares. Interesting set up, right? We moved to a Buy Rating on Tesla. The company told you they think they are going to blow out Street numbers. Nobody's listening. Insiders are. Sounds like opportunity.